Gunner 2 Game Review - Download and Play Free Version! 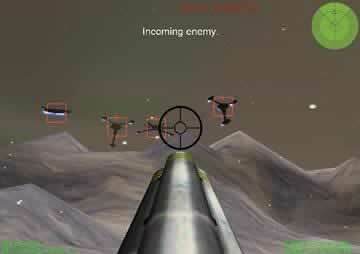 Destroy Attacking Enemies from the Past, the Present and the Future in Gunner 2! A Great Way to Blow Off Steam! Your forces are being attacked and it is up to you to stop the incoming attackers from obliterating your bases. 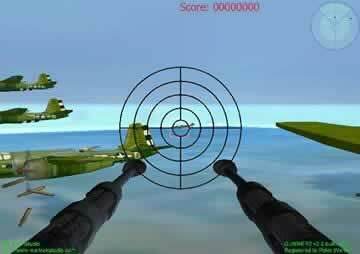 Put yourself in the gunner's seat in this 3D world of virtual war and choose from three different times periods to gun down the enemy. Battle WWII air fighters in the in the Pacific, Apache helicopters in the desert and UFOs in space in this intense and explosive first-person-shooter. All the levels are historically accurate and as you progress through them you get new and more powerful weapons. In the later levels you will receive the missile launcher that requires accurate shooting to be effective, but when you hit, look out! Other guns are interesting too, starting with simple turret guns and moving into chain machine guns, mini-rocket launchers and plasma blasters against the UFOs. Simply change weapons by using right-click. Blasting the enemies is an increasingly difficult task, as they are constantly changing between different fighters and gaining strength. There are two difficulty settings, novice and pro, but either way you'll need precision targeting to take down the enemy. The point-and-click technique will need to be mastered as you spin around 360 degrees searching for approaching invaders. You won't get bored with Gunner 2's versatile environments and ever-changing enemies. You really won't get bored with the detailed 3D graphics that provide explosions with intense bursts of light and color. So blast away and to the victor go the spoils! Gunner 2 is simple to play while still providing a challenge, so no matter what age you are, you can play! If you are a 4-year-old looking for a sci-fi adventure or a 70-year-old looking for a way to take on the axis you must play this game. Adjust almost every aspect of the game, from the controls, to the music, to the sound effects, to the difficulty and graphics in the options menu. The game features nine types of weapons, 19 enemy crafts, 35 levels, 3D graphics, studio-quality sound effects, and addictive gameplay. So if you want an addictive first-person-shooter that takes you through time to blast enemies, with unique levels and weapons, and easy point-and-click use, then download Gunner 2 today! Gunner 2 is an arcade-style shooter that will have you behind the sights of a fixed gun trying to fend of swarms of enemy aircraft. The action spans three episodes and an extra Xmas Crazy Pack with each set in a different time period. In Episode 1 you'll find yourself defending boats and bomber wings as you battle in different World War II era settings, while Episode 2 is set in a more modern setting with you defending bases from flights of enemy helicopters. Finally Episode 3 and the bonus pack will take you into the future where you must defend against a variety of UFO's in different space locales. Also, with each episode you'll come across a variety of weapons such as a B17's machine gun, gattling guns, rapids small missile launchers, and the all powerful rocket launcher. 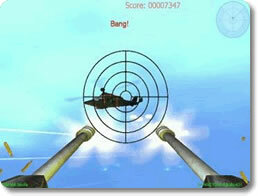 This mixture of environments and different fixed artillery adds a bit to the variety of gameplay and provides some rather intense fight sequences, especially later on in the episodes, where you'll be hard pressed to keep track of the many enemy aircraft swooping in from all directions. The gameplay though can start to get a little repetitive as you realize each mission is pretty much exactly the same. While the aircraft might change slightly between each episode, they act in pretty much precisely the same manner and they don't change all that much as you reach later chapters, there are just more of them and they take more damage before plummeting from the skies. Another issue is that each level gives you only one weapon and most are just variations on some kind of machine gun that are progressively more powerful as you make your way through the chapters in an episode, that is until you reach the higher two tiers of weapons and get to use rockets but that takes nearly 29 chapters before they are unlocked. Also, since your ammo just comes from your overall score there isn't much strategy or such concerns as swapping around weapons, you simply blast away with one gun until all the waves have been repelled. Overall, Gunner 2 does provide at least some variety and some intense moments as you try to fend off the hoards of enemies. While the gameplay can get a bit stale and repetitive, if you are looking for some mindless arcade shooting action then Gunner 2 is a perfect game for you. At the very least its worth checking out the demo and getting a taste of the gameplay to see if it's enough to drag you in for more hours of plane blasting action. Video shows clips from each of the missions and some of the guns you can use and enemies you will face.